Truthful and accurate horoscope – totally free! – Travel Much? Truthful and accurate horoscope – totally free! Taurus: The position of the stars and planets will not affect your life, in any way, shape or form, what so ever. Aquarius: The position of the stars and planets will not affect your life, in any way, shape or form, what so ever. Pisces: The position of the stars and planets will not affect your life, in any way, shape or form, what so ever. Aries: The position of the stars and planets will not affect your life, in any way, shape or form, what so ever. Capricorn: The position of the stars and planets will not affect your life, in any way, shape or form, what so ever. Gemini: The position of the stars and planets will not affect your life, in any way, shape or form, what so ever. Cancer: The position of the stars and planets will not affect your life, in any way, shape or form, what so ever. Leo: The position of the stars and planets will not affect your life, in any way, shape or form, what so ever. Virgo: The position of the stars and planets will not affect your life, in any way, shape or form, what so ever. Libra: The position of the stars and planets will not affect your life, in any way, shape or form, what so ever. Scorpio: The position of the stars and planets will not affect your life, in any way, shape or form, what so ever. Sagittarius: The position of the stars and planets will not affect your life, in any way, shape or form, what so ever. Naturally, my brand spanking new astrological sign “Olive” will cover all born mid-June. We are all incredibly beautiful, extremely intelligent and ridiculously witty (naturally). Our horoscope reads as follows: The position of the stars and planets will not affect your life, in any way, shape or form, what so ever. 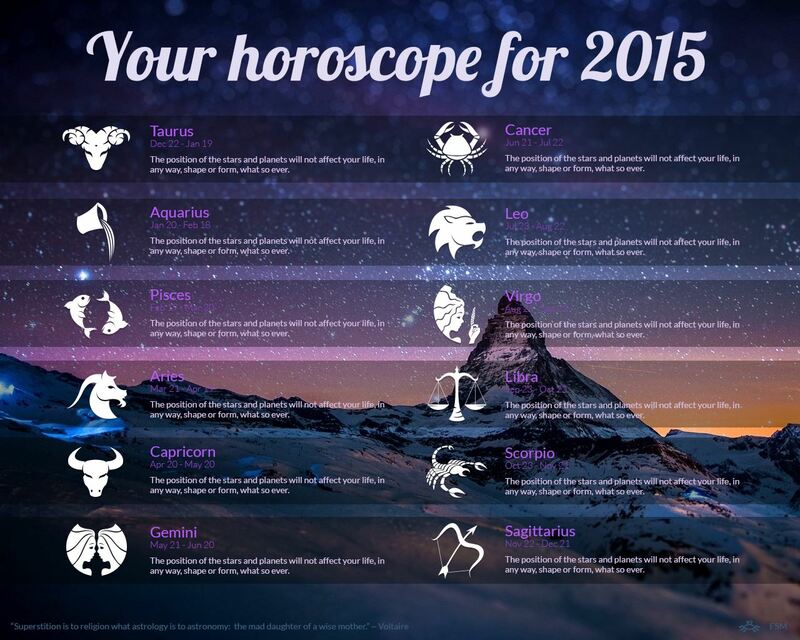 Please note that the validity of all above horoscopes can be extended for all eternity. Love this!! I was wondering where you were going with this article before clicking on it haha and it made my day! This is my kind of horoscope – no hidden horror in it at all. I love it! It made me smile.